On my recent trip to Germany while in Hamburg I was browsing at a wonderful photography bookshop at the Haus der Photographie and came across a little book called Sweet Nothings. 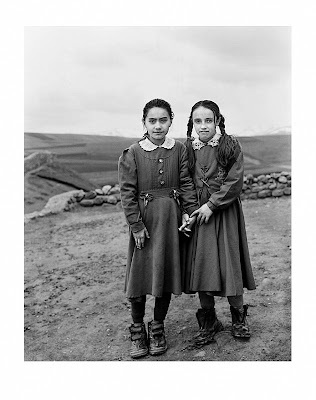 It is published by Foto8 and is a collection of images of portraits of "Rural Schoolgirls from the Borderlands of Eastern Anatolia." 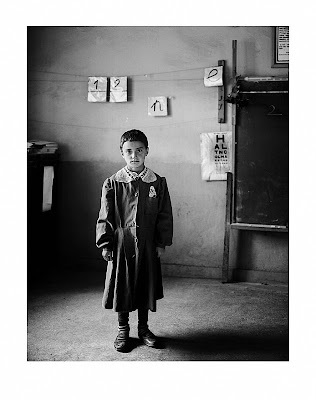 These engaging images are all taken from the same distance by photographer Vanessa Winship. It is a very special book. Winship's images describe so much - amongst these forty-five images the varied expressions capture warmth, shyness, alienation, friendship, bashfulness, and confidence. Winship said in an except taken from Lens Culture "The girls were a mix of emotions about this event, this small moment of theatre in front of them. They were excited, curious and a little nervous all at the same time. Many things touched me during the making of these images. I was touched by the gravity in their demeanour at the moment in front of the camera, their fragility, their simplicity, their grace, their closeness to one another, but most of all I was struck by their complete lack of posturing." In addition I have just spent the last half an hour on the website of Vanessa Winship and I was literally blown away by her other work from the Black Sea and the Balkans. Outstanding!